Don't we all love to have nicely organised clothes? I am a shopaholic, yes I admit it, recently I decided to change my tactic a bit, I would love to share with you my tips and tricks. Before I used to buy less practical items of clothing and never ever worn them. Now I tend to buy things that I will definitely wear and I tend not to get rid off my tags, until I wear something. If I don't wear the clothing within a month, I will return it. What the point of wasting money? You can always return or exchange, but make sure you check how much time to return you have on your receipt. Some shops very from 14 to 28 days, so keep an eye on that. Try to calculate if an item is defiantly worth a hefty price tag, is the quality worth the money? Do you really need another shirt in the same colour? This are the questions that I always have in my head before buying something. Always make sure you try something on before buying, I know, I know, it's boring and we all are lazy about it, but trust me this must be done. I am a person who hates trying on things, I am so bad that I will bring the clothes home (well of course I will pay for them first) and then I will try everything on, then I will need another trip to return certain items. What a time waste. 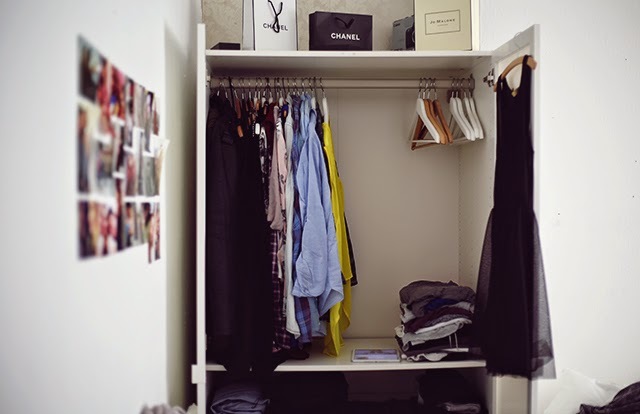 How to maintain your wardrobe space? Every 2 months I tend to clear out my wardrobe and take everything out and re-organise it. And I make 3 piles, to keep, put away (e.g winter clothes in summer) and sell. Be strict, haven't worn yet? Trust me sweetheart you won't, sell it or pass it on. Don't just keep things you won't ever wear, because you have spend money on them. Depop is a great quick and easy app to use, I will be selling lots of my clothing in few days, so make sure you are following me, here. Winter clothing takes up so much space, just put them away during hotter months. The Vacuum Storage Bags are so amazing, everything will take up so much less space, they are also handy for traveling. My favourite shops: H&M, River Island, Topshop, Miss Selfridges. These are the shops, where I shop the most. My wardrobe is created by the stores mentioned above. What about yours? Anything you been after recently? Any tips you have for me? This is very sound advice. I have a piece or two I should definitely not have bought, and kept because I forgot about it! Since moving to London I have become much more selective though. As I rent and therefore need to move every so often, I tend to only buy if I really think I'll wear the item a lot. Love your wardrobe, by the way. Really amazing tricks, I've recently cleared out my wardrobe and sold everything on ebay. It's so refreshing to get rid of the old and then you can justify investing in a few more great pieces.